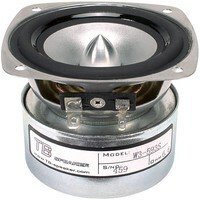 Tang Band has improved upon early versions of their 3-1/2" RBM subwoofers to produce the W3-2108. This driver has a much smaller frame, without sacrificing anything, allowing for much easier installation. Possibly the most capable subwoofer driver of its size, Tang Band's W3-2108 3-1/2" subwoofer acts much larger than it looks. 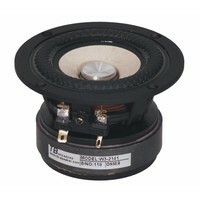 This driver uses a unique suspension consisting of dual surrounds and no spider to reach unheard of levels of excursion and linearity for a 3-1/2" subwoofer. With extensive venting of the voice coil, cone, and pole piece the W3-2108 can handle up to 50 watts max without an issue. 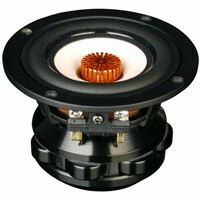 In addition, the extended back plate prevents the voice coil from bottoming out when driven beyond xmax. This little beast of a subwoofer will deliver response down to 45 Hz with remarkably low distortion. 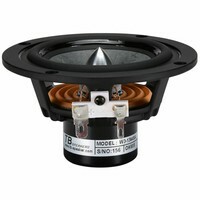 Tang Band designed their revolutionary RBM (Real Balanced Mode) flat subwoofers for ultra-linear operation, while remaining as thin as possible. The secret to their low distortion performance is in the patented symmetrical suspension system. While most subwoofers rely upon a spider/surround combination to keep the cone travel linear, Tang Band has developed a new injection molding process that incorporates front and rear cones, as well as dual opposed surrounds. 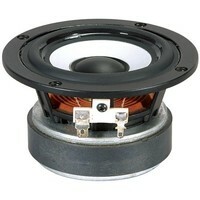 The added mass of the cone/surround assembly also reduces free air resonance.